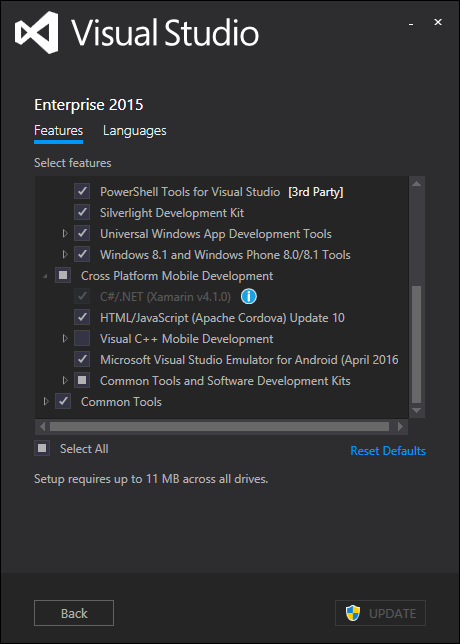 Visual Studio Tools for Apache Cordova is a Visual Studio extension for developing Cordova apps inside Visual Studio. It is bundled with Visual Studio 2015 and can be added as a feature when installing Visual Studio or at a later time by accessing the installer from Programs and Features dialog in Windows. Detailed installation and update instructions are included in the official documentation. Alternatively you could install packages with Visual Studio's dialog for managing Bower packages (accessible from Solution Explorer) or with Mads Kristensen's Package Installer extension. Either way, installed Bower packages will by default end up in bower_components folder in the root of your project. Since this folder will not be packaged with the application, the files will somehow need to be delivered to the www folder. Although you could achieve this by changing the target directory for Bower packages, it would not be ideal, because not all the files in a Bower package are meant for distribution with the application. All that's left, is making sure that the script will be run as part of Visual Studio build process. You can do that using Task Runner Explorer in Visual Studio - just add the main-bower-files task to Before Build binding. For effective TypeScript development you will also want to install TypeScript definitions (i.e. so-called typings) for the libraries, which you are using. Typings for most libraries are not included in their distribution packages; they are available from a separate repository, named DefinitelyTyped. For managing typings in a project, a TypeScript Definition manager comes in handy. Historically this has been TSD, but it recently became deprecated in favor of a new one, named Typings. As you can see, the complete file URL is used as location. Additionally, the name must also be explicitly set to the typings filename without the .d.ts. extension. You can imagine that installing typings for libraries with many dependencies, such as cordova can become quite tedious. All of the files in these folders will be restored as part of the configured build process, unless one of the repositories or a package in it suddenly becomes unavailable.